Why Hike to Artist Point? To see a Tunnel-View-like vista without engaging in the scrum for position that's the normal state of affairs at the actual Tunnel View. Best Time to Visit: After two or three tour buses have unloaded their swarms at the Tunnel View. If you want to take pictures, it'll also help if sunset is approaching and there are some big fluffy clouds accessorizing the eastern sky. Scenery Factor: It's similar to Yosemite's most famous panorama, the Tunnel View, but from higher and a bit to the southeast. In my opinion, it's superior to the Tunnel View. You don't see as much of Half Dome, and you miss Sentinel Dome and much of Sentinel Rock, but you do see more of Clouds Rest, plus things you can't see from the Tunnel View: Bridalveil Meadow, Royal Arches, partial views of North Dome and Ribbon Fall, plus a few corners of the Merced River. If you're a serious photographer, you'll find this spot eminently tripod-worthy. Crowd Factor: You'll probably see other hikers on the Pohono Trail section of the hike, but once you've turned onto the old stagecoach road, things should get considerably more lonesome. Given the stunning view and the relatively short hike to get to it, it's arguably the most undervisited place in Yosemite. This review probably won't help preserve the secret, though. Difficulty: On the easy/medium border: a 3 out of 10. It's a short hike, but the first half is steep, and you'll have to negotiate your way around some fallen trees on the second half. Still remarkably little effort for the view you get, though. Parking: At the Tunnel View. Most people are just here for a few minutes, so if both are lots are full, something will probably open up soon. If you're visiting in the winter, though, the lots might not be fully plowed and parking will be scarce, so you should show up a few hours before the sunset rush to get a spot. Nearest Bathrooms: There are pit toilets at the Bridalveil Fall parking lot, two miles east. Just follow your nose and you can't miss them. For toilets with plumbing, you'll have to go to Yosemite Village, another 5 miles (8 km) past Bridalveil. Nearest Snacks: At Yosemite Village, 7 miles (11 km) east. Getting There: The trailhead is at Yosemite Valley's Tunnel View vista. If you're already in Yosemite Valley, head to the western end of the valley and follow the signs pointing you to Highway 41 and/or Bridalveil Fall. The Tunnel View is about two miles (3 km) uphill from Bridalveil Fall. If you're in southern Yosemite, take Highway 41 north to Yosemite Valley. Immediately after you emerge from the tunnel that gives the Tunnel View its name, you'll see parking lots on the left and right. The trail departs from the right-hand parking lot. Here's a Google Street View panorama showing the trailhead area; pan left to see the Tunnel View. Trail Notes: The trail starts from the Tunnel View on the uphill side of the road. This is the Pohono Trail, which goes all the way to Glacier Point, passing several other points (Inspiration, Crocker, Stanford, Dewey, and Taft) plus Sentinel Dome en route. For this hike, though, you want to turn left half a mile along, where the trail intersects the old stagecoach road into Yosemite Valley. You'll reach Artist Point in just under half a mile. Shortly before Artist Point, you'll pass a viewpoint partially obstructed by trees; this isn't it - keep going and you'll find a much better view just around the corner. Just past Artist Point, the trail crosses Artist Creek. If you get this far, you've missed the literal point, though you'd have to be distracted by assorted bears and a flying saucer to overlook it. If you keep going, you'll eventually come out at Highway 41 a quarter mile uphill from Bridalveil Fall. Hazards: Small amounts of poison oak on the lower parts of the trail, possible large amounts of mosquitoes anywhere you linger - don't forget your repellent. The first half of the trail is often rocky, so pay attention to where you're going if you're a compulsive ankle roller. A few of the steeper rocky sections can also be slippery. Clearing fallen trees from the old stagecoach road doesn't appear to be a high priority for the park service; be prepared to go over or under several of them on the latter half of the trail. Though you may feel alone in the world here, a small section of Highway 41 is visible from the point and you will, alas, be able to hear traffic. Alternate Route: As mentioned above, Artist Point is on the old stagecoach road, and this road continues downhill from Artist Point and eventually merges with Highway 41 about a quarter mile above the Bridalveil Fall parking area. (Here's a Google Street View panorama of the spot where the roads meet. Note that this link seems to be spectacularly broken on iOS; bring it up on your computer instead.) The route from here is similar in distance and net elevation gain to the main route, but is less steep and consequently seems a bit easier - on the regular route, you climb via a series of switchbacks from the Tunnel View to the old stage road and then descend to Artist Point, but on this one you climb gradually all the way to the point. You will have to cross two streams along the way, though (Artist Point will be just past Artist Creek, the larger and potentially more troublesome of the two.) There's a pullout across the road that will fit a couple cars, and another a short distance up the hill. Artist Point Provenance: In June of 1855, artist Thomas Ayres stood here and drew a picture of Yosemite Valley - the first ever by a professional artist. It was published in James Mason Hutchings' California Magazine in 1856 and was a major contributor to the renown Yosemite Valley would soon begin to receive. Ayres didn't get long to enjoy it; he perished at sea in 1858, only 42 years of age. On the other hand, Ayres may not have stood here in 1855 and drawn Yosemite Valley. 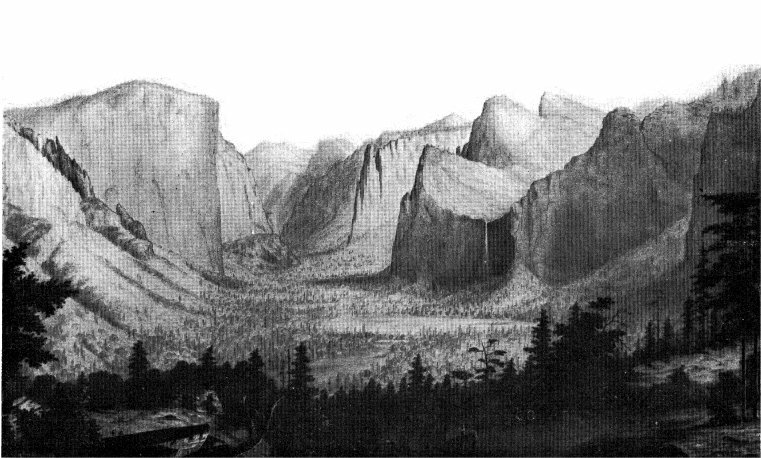 Ayres' famous drawing can be seen here (republished from Carl P. Russell's Early Years in Yosemite), and you've probably already noticed that this isn't the Artist Point we know - Sentinel Dome is visible, while the Royal Arches and North Dome are not. Ayres was most likely somewhere around Inspiration Point when he drew his seminal picture. So how did Artist Point become Artist Point? Probably through a clerical error - the same sort of institutional sloppiness and hidebound thinking that prevents the park service from reintroducing orcs and balrogs into Yosemite. On your next trip to Artist Point, snap a picture of yourself and then present it to the park superintendent along with the suggestion that the place be rechristened [Your Name Here] Point, since you have, after all, actually been there. I'm sure he'll be pleased to see you.